UNITED NATIONS, June 2 -- Georgia threatened to sanction Turkish-based businesses which opened branches or franchises in Abkhazia, a region Georgia soldiers not been in for more than a declare, and the declaration of independence of which Russia recognized last year. On June 2 at the UN, Inner City Press asked Ambassador Baki Ilkin, Permanent Representative of Turkey and President of the Security Council for June, to comment on the threat and if it has been resolved. Video here, from Minute 23. Ambassador Ilkin, noting that he spoke in his national capacity, said "Georgia and Turkey are re such close friends... I doubt Georgia would do something that would undermine in any way the relationship between the two countries. I don't accept the validity of what you've been reading." Well, Russia's Pravda reported on May 28 "Georgia ruins relations with Turkey over Italian clothes," referring to Benetton Turkey. The present aggravation between Georgia and Turkey was first noted in April 2009 when Georgian border guards detained several Turkish ships in neutral waters. Those ships were carrying construction materials, fuel and different commodities including pork to Abkhazia. Thus on May 5 they stopped “Denfa Demet”, on 24 May – “PUR NAVOLOK” freighter and the “New Star” - on May 30. In connection with the incidents Mr. Zaur Ardzinba, Director, “Abkhaz Merchant Marine Shipping Company” said: “Georgian border guards behave like Somali pirates in the Aden Gulf”. Click here for Inner City Press' May 29 coverage of... pirates off the coast of Somalia, some of whom are from Pakistan and Iran. As Inner City Press had reported Tuesday morning, Amb. 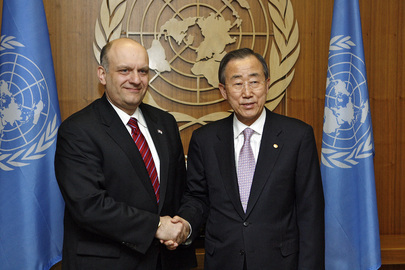 Ilkin confirmed that Ban Ki-moon will briefing the Council about Sri Lanka on Friday afternoon. Ilkin called it an "unofficial" interactive dialogue, instead of the word that for example Mexico's Claude Heller used in April, "informal" dialogue. Heller read out a press statement after his two meetings. But Ilkin when Inner City Press asked is there would be an outcome said, "not that I know of," adding that Sri Lanka is not on the Council's agenda. He also said that John Holmes will not brief. Video here, Minute 22. We'll be there. 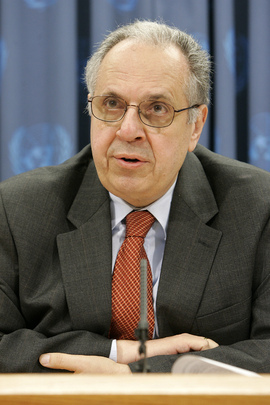 UNITED NATIONS, May 27, updated May 28, DPRK draft here -- Russia "blackmailed" the UN Secretariat of Ban Ki-moon into changing Mr. Ban's report on Abkhazia, Georgia's Ambassador to the UN Alexander Lomaia told the Press on Wednesday. Inner City Press asked if he meant that Russia threatened to veto the resolution to extend the mandate of the UN observer mission there, or as many have speculated threated to veto a second term as Secretary General. Ambassador Lomaia said he has heard that, but that the threat he knows of "first had" is to veto the resolution to extent the mission's mandate, set to expire on June 15. Video here, from Minute 25:39. Since the conflict of last August in which, after Georgia sought to retake to frozen conflict zones, Russian recognized as independent both Abkhazia and South Ossetia, Russia has urged changes to the name of the "UN Observer Mission in Georgia," UNOMIG. To Russia, these areas are not longer Georgia. Therefore, according to Lomaia, Russia walked out of the talks on the areas in Geneva, until the UN re-titled its report. Lomaia mentioned Russian Foreign Minister Sergey Lavrov's visit with Ban Ki-moon on May 11 as part of the "pressure of Russia on the Secretariat." Video here, from Minute 13:19. After Ban Ki-moon wouldn't call Kosovo's breakaway from Serbia illegal, rumors circulated that Russia was threatening to veto Ban's future bid for a second term. Since then, Ban's position on Kosovo was become more pro Serbian and Russia, and now the report on Abkhazia [Georgia] is renamed. Lomaia called it blackmail. Only two journalists asked questions. Inner City Press asked about the unrest in Georgia, and also whether the country recognizes Kosovo's declaration of independences. Lomaia, whose predecessor Irakli Alasania is now a major opposition figure, said that Georgia respects the rights to free speech. On Kosovo, he said as he had to that Georgia does not recognize Kosovo's independence. When Inner City Press pointed out that on this, non-recognition of Kosovo, Georgia has the same position as Russia. Lomaia scoffed. He said that unlike Georgia's, Russia's commitment to sovereignty and territorial integrity is selected. Comparative analysis: Given Russia's support of the Abkhazians' and South Ossetians' breakaway from Georgia, Russia's decided opposition to independence aspirations by Tamils in the northern part of Sri Lanka is striking. Russia focuses on the LTTE as terrorists, and anaogizes to Chechnya or the terrorist taking of the school in Beslan. Georgia claims that Abkhaz and South Ossetians engaged in ethnic cleansing, but does not use the word terrorism. Selectivity is everywhere. Watch this site. Diplomatic footnote: after a by-invitation only briefing at the US Mission to the UN Wednesday afternoon, unrelated wire service stories were published quoting unnamed... "U.N." diplomats that an agreement in principles on sanctions against North Korea had been reached. On May 28, France's Ambassador briefed selected journalists in the UN Delegates' Lounge, reportedly leading to a protest by uninvited television journalists perceived to be more interested in the Middle East. By contrast, Georgia's Ambassador Lomaia made his charges on the record on UN TV and took questions from any journalist who chose to come. Russia is somewhere in the middle: Ambassador Churkin spoke only briefly in English on UN TV -- Inner City Press asked for Russia's view on Ban's security zone proposal, Churkin said, Too early, video here from Minute 1:11 -- but then long longer to Russian media. It was translated for Inner City Press as including that Russia will seek an embargo against offensive weapons to Georgia. Lomaia bristled that Georgia has a right to reach what agreements it wants. And to say whatever it wants, apparently. We will continue to cover this. The claim by the Georgian Permanent Representative that the Secretary-General amended his report on Georgia in response to “Russian blackmail” is categorically rejected. The statement itself is very unfortunate. The principal concern of the Secretary-General in the drafting of his Report has been that all concerned parties should engage on the substantive issues in question, more specifically on a mechanism to guarantee safety and security in this troubled region. The adoption of the title was meant to avoid unnecessary politicization of the debate among members of the Security Council and reflected his view of what all members could live with. The Secretary-General rejects any suggestion that any threats were made to him in this connection. Update of May 28, 6:20 p.m. -- Russian Ambassador Churkin came out of the Council's North Korea consultations to speak, not about the draft DPRK resolution which Inner City Press obtained and exclusively published Thursday morning, but rather about Georgia, and mostly in Russian. Inner City Press asked if he denies Georgia's claim that Russia blackmailed Ban Ki-moon into changing the title of the Secretariat's report on Abkhazia / Georgia. Yes, he denies it. Amb. Churkin asked, You don't speak Russian yet? Watch this site.